The PICASO trial run by project partner UDUS was presented at the Annual European Congress of Rheumatology (EULAR) in Madrid, Spain, in June 2017. 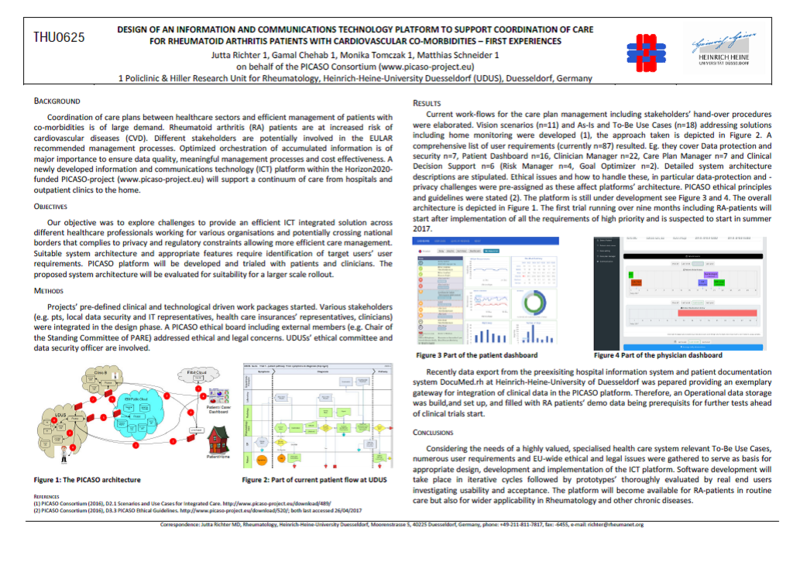 The poster presentation focused on the experiences and knowledge gained so far in developing the PICASO platform and setting up the UDUS trial. The trial will implement and demonstrate the technical solution developed in the project and it will involve 30 patients with Rheumatoid Arthritis and cardiovascular co-morbidities. The paper entitled “Design, development and implementation of an information and communications technology platform to support coordination of care for patients with Rheumatoid Arthritis and cardiovascular co-morbidities – first experiences” was presented at EULAR by PD Dr. Jutta Richter, UDUS, Policlinic of Rheumatology. The presentation abstract is available from the EULAR Abstract Archive here. Download the EULAR 2017 Poster.